We stock a great range of wooden cubbies, swing sets and play systems for our QLD customers. Our warehouse is located in Mackay. All sets are available to collect 10-15 days after ordering. Browse our full outdoor play equipment range on this page.Our collection points are located with accessibility for each state in mind. Our Mackay, QLD pick up point is a short 5 minute drive from Mackay Airport. 15 - 20 working days after payment. All of the cubbies, swing sets and play systems shown on this page are available for pick-up from our local depot in Mackay, QLD. We stock all items, so you can pick-up 15-20 working days after order. Our collection points are located with accessibility for each state in mind. 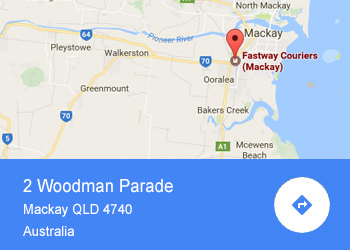 Our Mackay, QLD pick up point is a short 5 minute drive from Mackay Airport. If you're interested in purchasing using our "pick-up" service, but still have questions then please read the following FAQ section as this will hopefully answer the majority of questions that people ask about our service. Which outdoor play equipment is available from the Mackay pick-up Depot? All cubbies, swing sets and play equipment shown on this page are available for pick-up from our Mackay pick-up point 15-20 working days after ordering. Browse the range above and click on the product image for more detailed product information, images and full specification. Is the stock available to pick-up today? No, we're afraid not available to pick-up immediately, although you'll normally be able to pick-up within 10-15 working days after order. Once accepted it will be sent to our warehouse team who will pick and prepare your boxes. They will contact you as soon as your order is ready to pick-up. What happens if I have missing or damaged parts? In the unfortunate (and rare) circumstance that you have missing or damaged parts then we will of course replace these for you asap. All you'll need to do is complete a quick parts form (here) and we'll ensure they're dispatched out to your specified address within a few days. We may contact you if we need images or additional information to be able to process the parts claim. Do I have to pay for pick-up? We charge a small delivery fee to get your item from our distribution centre to your local Mackay pick-up point. Will the Mackay depot hold the stock? The depot will hold your products for one week from the date you are notified the goods have arrived at the depot and are available for pick-up. We're afraid we cannot hold stock longer than this without incurring storage charges. How big are the climbing frames, play centres or cubby boxes? The box sizes vary depending on the product ordered. Each product has a different amount of wood, so we recommend all customers check the packaging dimensions on the product page to ensure your vehicle is big enough to carry the boxes. For climbing frames with swings the fort legs and swing beam are the longest which are approximately 2.5m long. Can I view the products at the depots? The Mackay depot is a pick-up point only and is not a display centre. The products in the Mackay pick-up depot are fully flat packed (and cardboard wrapped) and are awaiting customer pick-up. All our product information including images, descriptions, dimensions and customer reviews can be found on our website. Do I just take my invoice to show on pick-up? As play equipment is a high value purchase, we feel this security measure is necessary to ensure that you, us and the warehouse can be confident we are all protected. We apologise for any inconvenience.